A consortium between Stadler Pankow and Siemens has finished assembling the first of a fleet of new S-Bahn trains. 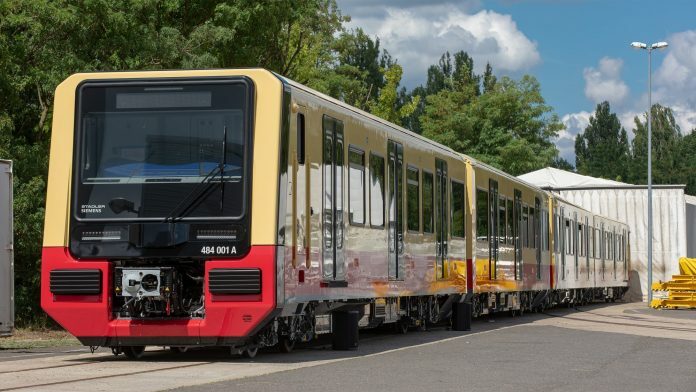 Commissioning of the four-car Class 484 EMU will now commence at Stadler Pankow’s site in Velten, where the finished vehicle will be brought into an operational condition. Following this, the vehicle will be taken to Siemens’ test centre in Wegberg-Wildenrath for static and dynamic testing. The milestone follows an announcement in October last year that assembly of the pre-series S-Bahn trains had begun. S-Bahn is investing around €900 million in new rolling stock, as well as adjustments to the Grünau depot. This covers 85 four-car units and 21 two-car units. Siemens is supplying the main electrical components, such as: drive converters, auxiliary converters, vehicle control systems, passenger information systems, bogies and the braking system. Stadler is responsible for the mechanical components, such as: body, interior, seats, doors and air conditioning. The delivery of the main series will be completed by 2023. Stadler Pankow managing director Ulf Braker added: “The completion of assembly work on a first vehicle in a series is always something special.